Nutritional problems broadly fall into two categories, i.e. those resulting from insufficient intake relative to nutritional needs and those resulting from excessive and unbalanced intake of food or a particular dietary component. The main problems in Africa and elsewhere in developing countries pertain to the first group. One of the principal aims of nutrition education must therefore be to provide people in rural and urban areas with adequate information, skills and motivation to procure and to consume appropriate diets. Such education should cover improvement of family food supplies and more efficient utilization of available food and economic resources to provide nutritious diets and better care for the most vulnerable groups. For those richer sectors of society where diseases of affluence are taking an increasing toll, nutrition education should be directed to proper food selection, consumption and lifestyle. Nutrition education programmes should have at least three components which should be directed at the various social groups. · Increasing the nutrition knowledge and awareness of the public and of policy-makers. This can be achieved by providing information on the relationship between diet and health; the relationship between nutritional and health status and individual productivity and national development; the nutritional needs of the population and of individuals; the importance of ensuring the quality and safety of the food supply; the causes and consequences of nutritional disorders; and the benefits of food labelling and legislation. · Promoting desirable food behaviour and nutritional practices. This can be achieved by providing information on the nutritional value of foods; the components of an adequate diet; making appropriate food choices and purchases from available resources; hygienic food preparation and handling of food; storage, processing and preservation of food; and equitable intrahousehold food distribution according to the nutritional needs of family members. · Increasing the diversity and quantity of family food supplies. This can be achieved by providing information on methods of improving food production; crop selection and diversification; proper storage, preservation and processing; conservation of nutrients during food preparation; and the prevention of food waste. Each of these components makes a special contribution to nutritional improvement. All three are important and need to form part of nutrition education and training programmes for personnel in agriculture, education and health in African countries. At the community level the people affected by nutritional problems should participate in determining which components should receive most emphasis to bring about lasting improvements in local food and nutrition conditions. Household food security, as discussed in previous chapters, is a prerequisite for people to have an adequate and balanced food intake. However, to attain good health and nutritional status, people also need sufficient knowledge and skills to grow, purchase, process, prepare, eat and feed to their families a variety of foods, in the right quantities and combinations. This requires a basic knowledge of what constitutes a nutritious diet and how people can best meet their nutritional needs from available resources. Undesirable food habits and nutrition-related practices, which are often based on insufficient knowledge, traditions and taboos or poor understanding of the relationship between diet and health, can adversely affect nutritional status. However, people can adopt healthier diets and improve their nutritional well-being by changing their food and nutrition attitudes, knowledge and practices, if sufficient motivation is provided to do so. The goal of nutrition education is to reinforce specific nutrition-related practices or behaviours to change habits that contribute to poor health; this is done by creating a motivation for change among people, to establish desirable food and nutrition behaviour for promotion and protection of good health. People are given help to learn new information about nutrition and to develop the attitudes, skills and confidence that they need to improve their nutrition practices. Nutrition education provides people with correct information on the nutritional value of foods, food quality and safety, methods of preservation, processing and handling, food preparation and eating to help them make the best choice of foods for an adequate diet. The provision of correct information is not in itself a sufficient objective to improve nutrition. Successful nutrition education goes beyond the simple accumulation of knowledge, towards positive action. A change in behaviour leading to desirable nutrition practices could include, for example, beginning to grow and eat dark-green, orange and yellow fruits and vegetables to protect the body from infectious diseases, or learning how to store maize or other food more safely to reduce nutrient losses and thereby increase household food reserves. Effective nutrition education programmes must therefore be planned and executed in such a way as to motivate beneficiaries to develop skills and confidence for the adoption of positive and lasting practices. Successful nutrition education often entails the active participation of the people, their awareness of their nutrition problems and their willingness to change. To be effective, a comprehensive nutrition education programme also requires intersectoral collaboration among different professionals (in agriculture, education, health and communication) and should be based on a well-planned communication strategy, often using a multimedia approach. It has been shown that in addition to technical assistance, contributing factors to the success of a programme include strong political and government support, external funding and the strengthening of local managerial and community capacities. Nutrition education programmes will not work in situations of severe resource constraints. For example, advising people on the establishment of home gardens in drought-prone areas is inappropriate if facilities for irrigation do not exist. Similarly, it is inappropriate to teach a mother to give her child high-energy foods to which she has no access. The sections that follow discuss the advantages and limitations of different approaches towards nutrition education, including conventional and current methods; the content; and key features that contribute to the success of nutrition education programmes. For the past 20 years there has been intense debate on the strategies, objectives and methods of nutrition education (Andrien, 1994). Conventional education methods consisted mainly of talks given at health centres. Today this approach is considered largely ineffective unless it is fully integrated into a broader nutrition education strategy. The conventional method has largely given way to approaches based on modern communication sciences. A review of nutrition education programmes in developing countries (Cerqueira, 1990) concluded that many nutrition education efforts implemented during the 1970s and early 1980s brought few changes in nutrition-related behaviour or nutritional status. Programme failure can be attributed largely to the ineffective communication methods used and the inappropriate content of the messages, which often ignored the specific cultural context of the community. Most nutrition education activities have been implemented within the health sector, especially in primary health care. Conventional strategies for education focused on face-to-face contact with the patient, using didactic methods of education and one-way transfer of information. Nutrition messages were considered as treatment, like medicine, for curing a nutrition problem. Within this context nutritional science, rather than the concerns of the participants, dictated the content of nutrition education. Common examples of this approach are telling mothers to eat more green vegetables or to breastfeed their children and teaching the three food groups in health clinics (see Chapter 7). Today, such a top-down method of nutrition education is considered largely ineffective for a number of reasons: it often makes use of only one channel of communication (i.e. face-to-face) instead of using a multimedia approach, with the result that very few people are reached, especially in Africa, where less than half the population is within the catchment area of health facilities; it addresses mainly women, who are not always able to remove the causes of nutritional problems by themselves, as their husbands and other family members often influence decisions regarding food purchasing and food allocations within the family; it focuses on the promotion of individual behaviour change rather than fostering active community participation; it emphasizes technical and scientific information about nutrients and nutrient deficiencies; and it pays little attention to people's social and cultural context, instead of building on indigenous knowledge about local foods and food preparation and promoting healthy eating patterns. More recent experiences, in contrast with the conventional approach, show that nutrition education is concerned not only with imparting knowledge, but also with finding ways to work with individuals or groups in the community in a systematic manner that will stimulate their participation in and commitment to the learning process. Nutrition education undertaken in this spirit is interactive, encourages an exchange of information between the educator and the community and empowers people to make appropriate choices using both scientific and local knowledge. Moreover, it leads to the adoption of improved behaviour and contributes to lasting effects and changes. Social marketing approach. Social marketing is defined as the promotion of socially responsible products, behaviour and ideas. It is based on strategies to change human behaviour through the application of commercial marketing principles. Consumer research is used to identify the cultural norms, aspirations and needs of the target group, and then specific messages are designed to promote changes in attitudes and behaviour believed to be socially beneficial to the individual or the target community. Social marketing has contributed substantially towards the development of modern communication approaches in the past 20 years. At the heart of the social marketing philosophy is the belief that consumer decisions involve choices among alternative behaviour patterns. The alternatives vary in the benefits that they offer and the sacrifices that they entail. For each set of alternatives (e.g. breastfeeding versus bottle-feeding) the consumer will weigh the perceived benefits against the costs, in terms of economic assets, time, energy or personal and social value. The challenge for the social educator is to imagine himself or herself in the position of the focus group (e.g. a group of mothers, schoolchildren or teenage girls) or individual in order to understand more fully how to make the proposed behaviour more attractive than any competing alternatives. The planning and implementation of a social marketing nutrition education programme follow an accepted pattern in which an initial field investigation is used to assess the current nutrition situation and the knowledge, attitudes and practices of consumers on, for example, infant feeding practices. The emphasis on community-oriented information then helps to determine the specific needs and expectations of the community or the target audience. As a second step, the information is used to construct and produce receiver-oriented messages. The messages are then used to promote a few key behaviour changes within a chosen population group, with the locally available resources and the cultural context taken into consideration. An important part of the strategy is audience segmentation. Instead of addressing an audience as a single unit, social marketing specialists divide a community into various groups with similar interests in relation to the behaviour under consideration. Then the benefits of the proposed behaviour most relevant to each interest group are identified, together with those behaviours that adversely affect a group's household food security or nutrition ("resistance points"). Each sector of the population is thus treated according to its members' characteristics, needs, wants and predisposition. Box 71 discusses some social and economic constraints to the adoption of new behaviour as perceived by social marketing experts. Selecting the channels of communication to deliver a message is the third step. Combined use of interpersonal communication and mass media (radio, television and the printed press) is often synergistic and can help in the attainment of different objectives. The mass media can bring new ideas to large audiences, encourage favourable attitudes and generate support among opinion leaders. Interpersonal communication can provide the intimate, interactive contact with clients necessary for final habit change. Development and pre-testing is the fourth step in social marketing, followed by monitoring and evaluation, which includes measurement of the overall impact of the communication programme (degree of habit change, number of people adopting the change, etc.). A great deal of experience has been documented in the social marketing of childhood immunization, breastfeeding and the use of oral rehydration solution. However, social marketing also has limitations, as reliance on mass media has not always led to sustained behavioural changes. Community-based approach. Evidence from different countries shows that combining interpersonal programmes at community level with the support of the mass media is the most effective way to educate people. It is increasingly recognized that unless people are offered the opportunity to participate actively in seeking solutions for their nutritional problems, the long-term impact of an intervention will be marginal. Identifying constraints to change or "resistance points" adoption of new behaviour is essential. An educational campaign's success in large measure depends on the capacity of social marketing to address constraints with appropriate educational and motivational techniques. The major types of constraint that can be addressed by education and communications are: gaps in knowledge; gaps in skill; cultural or ideological constraints; and social constraints with changing importance for each audience group. A long experience of poverty and deprivation can condition people psychologically. A chronic lack of resources and opportunities may lead to an almost fatalistic acceptance of their condition. This kind of attitude, which in some ways represents a successful adaptation to poverty, has important implications for social and behavioural change. Individuals living in highly deprived circumstances frequently attribute their fortunes and misfortunes to uncontrollable outside agents and do not perceive themselves as being capable of effecting desirable changes in their environment through their own actions. Overcoming this kind of environmentally induced and culturally reinforced passivity requires a long, slow process of sensitization and learning. From an economic point of view, certain kinds of problems may not be immediately resolvable even though their existence and nature are not in question. It is ill advised to develop a campaign to teach people to boil water if there is not sufficient fuel. In such cases, it is unwise to attempt a change through education. There are also economic trade-offs which require careful consideration in promotion of behavioural change. Taken out of context, extended breastfeeding sounds like an intrinsically healthy and desirable activity. Even where bottle-feeding is becoming more and more widespread, many mothers are still willing to acknowledge that breastmilk is best for babies. Breastfeeding, however, takes place within a certain economic and social environment. More time spent breastfeeding will probably mean less time available to spend working in the garden, attending other family members or participating in economically desirable activities. A mother who is truly committed to breastfeeding may have to forego possibilities of wage employment altogether in order to be constantly within reach of her infant. Many mothers, particularly those who are single heads of household, are not free to make this choice. Most people cannot be expected readily to accept or to support a change in behaviour that they perceive to be against their own self-interest. In such environments, educators using social marketing techniques have two choices: to attempt to sensitize the community to the value of a proposed behaviour change objective; or to promote strategies that work within a given socio-economic context (e.g. in the case of breastfeeding to convince employers to set up creches or to allow ample maternity leave). Source: Adapted with permission from UNESCO, 1987. The community-based approach to nutrition education, which encompasses the best elements of the two approaches, emphasizes the importance of active community participation in making decisions and finding solutions for nutritional problems. The community-based approach addresses the need for increased coverage, with widespread training of community workers and members; the importance of building on indigenous knowledge by incorporating community members as partners in programmes; and also the need for actions to transform the socio-economic conditions of the community (Cerqueira, 1992). With a strong participatory approach, the nutrition educator acts as a facilitator who assists the community in identifying and examining the factors that influence malnutrition and helps people to suggest solutions and implement actions to overcome nutritional problems. Community-based nutrition education thus becomes part of a much wider programme aimed at improving health and nutritional status within the context of socio-economic development, and is not an end in itself. In the community-based approach the communication strategy involves face-to-face group interaction between the nutrition educators and the community members, yet learning is not restricted to the moment of delivery of the message; it also takes place in the context of many other activities. The involvement of the community members with nutrition educators in planning and carrying out these activities is an important part of the learning process. An example would be a feeding programme to care for children while a group of mothers engage in income-generating activities such as production of vegetables or other foods to sell or consume. Although community participation in nutrition activities and education programmes is considered vital to their success and sustainability, there are also recognized limitations to this approach. As community participation changes the structure and relations of power in decision-making about the use and control of resources, it is often seen as threatening to established institutions and groups such as ministries of agriculture and health or village leaders. Changing from a top-down to a consultative style of leadership requires basic, continuous training and time. The goal of participation is to build a community's capacity to recognize its own problems and begin to solve them; nevertheless, participation needs an initial stimulus and continued support, technical expertise and funding from outside sources. Although the possibility of short-term behaviour change has been demonstrated in the literature, its sustainability is doubtful. Generally, among experts in nutrition education it is now recognized that changing food and nutrition behaviours in a sustainable manner is a long process requiring many steps by different sectors and at different levels. Nutrition education needs to be comprehensive and coordinated for effectiveness, to be participatory and to encourage ownership by the community. As in all programmes, proper planning is crucial for the success of a nutrition education programme. Nutrition education is effective only when it is based on adequate analysis of the nutritional problems and clear and concise definition of the objectives and the methods of communications. The social communication approach to nutrition education promoted by FAO combines elements of the social marketing and the community-based approaches. It emphasizes community participation in programme planning and implementation and recommends the use of multimedia strategies, i.e. several channels of communication, to influence undesirable behaviour patterns related to nutrition. A schema has been developed which divides programme planning into four phases: problem identification, formulation, implementation and evaluation (Figure 36). Analysis of the causes of malnutrition shows that many factors contribute to nutritional outcome. Therefore, an effective nutrition education programme should ideally be developed by a multidisciplinary team consisting of a nutrition educator, a communication specialist, a community leader and representatives of the beneficiary groups, all working together. The multimedia approach in itself requires intersectoral collaboration, as the use of several channels of communication generally implies the participation of different ministries. Intersectoral activities need to be well coordinated to ensure that all groups (e.g. health, agriculture and education departments, nutrition units and the food industry) and media (e.g. posters, booklets, radio and television) deliver consistent messages on a problem at all levels - national, regional and local. This aim also requires collaboration among non-governmental organizations (NGOs), government ministries and institutions, the private sector and external assistance agencies. Government ministries are in the best position and have the mandate to facilitate coordination and collaboration among the different partners. Governments can, moreover, assess how the respective nutrition education activities planned fit into their development plans and into the nutrition education component of their national plan of action for nutrition, developed following the International Conference on Nutrition in December 1992. Planning and developing a nutrition education programme should begin with the systematic analysis of nutrition and health-related problems in a community. The use of focus groups within a community (e.g. rural women of child-bearing age, health workers or male subsistence farmers) can be particularly effective in such an analysis.1 A situation analysis examining the factors that give rise to nutrition problems can be carried out through a combination of direct and indirect methods. Possible methods include literature review; nutrition surveys to analyse the epidemiology of the nutrition problems; and participatory nutrition appraisal, during which the people concerned, with the assistance of the nutrition education team, identify and analyse the food and nutrition issues of greatest interest to the community and of specific groups within it; such issues may include high levels of infant malnutrition, childhood illness and infant deaths. 1 A focus group discussion usually involves a minimum of six and a maximum of 12 people at a time. The discussion is focused on a certain topic by a facilitator using a well-prepared guide, but it is then allowed lo run as freely and widely as possible. The intention is that members of the group spark ideas off each other while the facilitator takes a back seat and notes the main points of view and opinions that emerge. A skilled facilitator will also be able to assist people in gaining greater awareness awareness of their own behaviour patterns and motivations. Once the nutrition problems have been identified, the nutrition educator can facilitate a discussion about the factors (e.g. social, economic and cultural) that contribute to the problems. The discussion is an interactive process between the participants and the nutrition education team. Participants are asked to describe the nutrition problems they see and how they perceive their own social and economic circumstances, including income, employment and resource problems. They are also encouraged to share information regarding household food security (including problems such as hunger, insufficient money to buy food or too little land and water to grow food) and to consider which sections of the community are most affected and why. 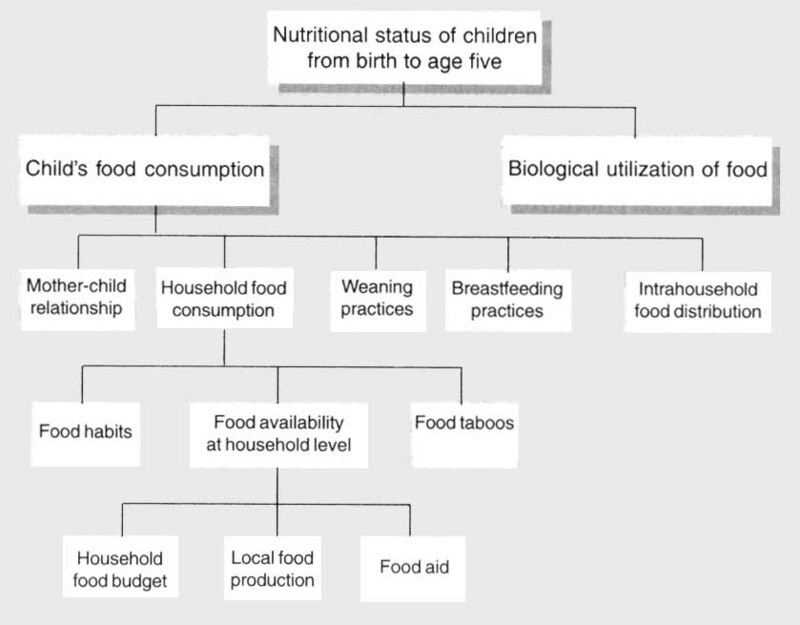 The group constructs and prioritizes a chain of causal factors and behaviour patterns affecting nutritional status (see Figure 37). Among the factors influencing a course of action, a distinction has to be made between those that can be tackled by the people concerned and those that are out of their control. In any event, understanding of why people behave as they do is crucial to the ability to influence or change certain types of behaviour. This understanding can be acquired through audience analysis using in-depth interviews or individual or focus group discussions which aim to elicit the factors that motivate people to behave in certain ways. Once the factors and behaviour patterns on which action needs to be taken have been identified and discussed with the community, the next step is to formulate an action plan and a communication strategy. The questions to be considered when developing a communication strategy are shown in Box 72. To plan a strategy, it is necessary to define clear objectives. The nutrition education team determines the goals and objectives of a communication campaign, which should be defined for each group of beneficiaries (see Box 73). During this stage messages are designed, materials are field tested, and the media are selected (see section on "Messages, media and support materials", below). A multimedia plan is formulated in which all communication activities are integrated. An overall communication strategy provides a framework for developing and delivering messages aimed at changing nutrition practices. · To whom should the message be directed? · What message should be communicated? · How can the message best reflect the audience's attitudes and beliefs? · Which media should be used? · What settings are most appropriate for effective communications? · What times are best suited to successful communications? The choice of a communication strategy must be linked to the planned intervention. The development of an appropriate communication strategy must follow a systematic field investigation into the knowledge, attitudes and practices of the beneficiary population. Source: Adapted with permission from IVACG, 1992. The implementation phase begins with the production of the support materials. In addition, field staff or "change agents" (e.g. health and agricultural extension workers and teachers) need to be trained to ensure that all persons involved in the various communication activities carry out their roles adequately. They must be very familiar with the communication activities to be able to communicate messages effectively. Since a single medium cannot by itself significantly alter nutrition-related habits, nutrition education normally entails the use of different media, which calls for training of all involved and effective coordination. Once the materials and training have been established and ensured, communication with the people can begin. Evaluation of a communication programme is important but is often done inadequately. The evaluation should be conducted with the participation of the beneficiary population and the field workers or change agents, as the actions to be evaluated concern them directly and the evaluation may help them improve their performance. Government representatives should also participate so they can see the impact of the activities they have promoted and consider further expansion of the programme. Improvement in the health and nutritional status of infants at risk of malnutrition. Increase by 50 percent the number of infants, identified at risk of malnutrition, receiving energy-dense weaning foods by six months of age on a daily basis, two years after the start of the infant feeding nutrition programme. · A knowledge, attitude and practices (KAP) study on infant feeding carried out by the national nutrition institute with regard to beliefs, knowledge and practices of mothers or caretakers by month 4 of the programme. · Training materials for trainers and nutrition education materials and messages for the public, based on the findings of the KAP study, prepared, field-tested and published by month 9 of the programme. · Four one-week training courses on infant nutrition and processing and preparation of local weaning foods held by the institute of food and nutrition by month 12 of the programme. · Ten trainers and 60 health and home economics workers trained and competent in infant nutrition, home processing and preparation of locally available weaning foods by month 12 of the programme. · Sixty groups of mothers of infants at risk of malnutrition (ten mothers per group) identified in the programme area who are ready to participate in the infant feeding nutrition programme. · For each group of mothers one training, demonstration and consultation session on infant feeding and processing and preparation of weaning foods held by each health or home economics worker on a weekly basis, from month 13 to month 24 of the programme. · Assess the training and capacity building needs of health and home economics staff to enable the effective implementation of the infant feeding nutrition programme by month 5 of the programme. · Prepare a training plan and programme for training of trainers and community members on infant nutrition and the processing and preparation of locally appropriate weaning foods by month 8. · Select ten trainers and conduct one training of trainers course on infant nutrition and weaning food processing and preparation by month 11. · Conduct three practical field-based training courses for community health and home economics workers on infant nutrition and weaning food processing and preparation by month 12 of the infant feeding nutrition programme. A main weakness in the evaluation of nutrition education programmes is that often quantitative changes are not assessed. Well-defined programme objectives, however, allow measurement of success. For example, if the programme goal was to increase the number of mothers who produce green leafy vegetables and add them to their children's porridge, then the evaluation should measure the number of mothers who have adopted this practice as a result of the project's communication and extension activities. To provide guidance for expanding or continuing a programme, it is also important to examine why changes did or did not occur and which aspects of the communication and other activities were most effective in promoting change. If the attitudes of a significant number of mothers did not change, the evaluation must determine whether the mothers understood the message as intended and whether they encountered difficulties in finding, growing or cooking vegetables. It is necessary to define the degree of behaviour change that is considered successful. If the programme objective was to increase the number of mothers feeding their children vegetables daily, then feedings taking place only once or twice a week indicate a failure. Regardless of the results, however, the outcomes of the evaluation must be made known to the proposed beneficiaries and discussed with them so as to help improve and reinforce newly adopted behaviour. The beneficiary population for a nutrition education intervention is normally made up of several groups. The vulnerable group may not be among the groups to whom the messages are directed. For example, a group at risk of vitamin A deficiency may be weaning-age children. In this case the educational intervention will be directed at all those involved in or interacting with those involved in the care and feeding of weaning-age children, such as mothers, grandmothers, adolescents and the family. The primary group is composed of people whose behaviour is to be modified; the secondary group comprises people who act as intermediaries, i.e. those who will deliver the message to the first group, such as health workers, nutritionists, horticulturists, agricultural extension officers, teachers, broadcasters and journalists. The composition of the secondary group depends on the type of communication network that will be used. The tertiary group is made up of people who can help to make the programme a success through their influence and authority. These may include community leaders, financial donors and politicians, together with members of the extended family of the at-risk child (see Box 74). An example showing the different beneficiary groups for the prevention of protein-energy malnutrition is given in Box 75. The approach and the message wild vary for the different groups, depending on language, interests, educational level and socio-economic status. Messages addressing problems that are not perceived as problems by the community wild not make much impact, even if the nutrition worker knows that these problems exist. The different perceptions may result from lack of information in the community or from widely held cultural beliefs. For example, a condition of tiredness and dizziness during pregnancy may be so common as to be considered normal, although it may be attributable to low food intake and anaemia. Similarly, traditional customs regarding the order of serving food or the best foods for weaning-age children may be so well established that the possibility of any ill-effects arising from the practices will never be considered. In these circumstances, before change can be expected it will be necessary to explain convincingly the reasons why change is needed. Many nutrition communication programmes focus on mothers as the main providers of food and child care in many households. However, other family members, especially fathers, are often influential in decisions regarding food purchasing and intrafamily food allocations. Mothers have the prime responsibility for feeding and caring for their children; yet when there are breaks in culturally established patterns of feeding, other family and community members often play a key role. For example, in Mali men often provide millet (the main staple food) for their family and sometimes purchase other foods in the market. The Mali Nutrition Communication Project is designing messages to encourage men to provide their wives with more millet (which the wife can barter for other food commodities), more nutritious market foods (such as fried bean cakes or carrots) and additional food during pregnancy. Family members, including in-laws, influence dietary practices not only by their opinions and their financial contribution to food purchases, but also by the amount of labour they contribute to the household. Changes in nutrition behaviour often entail shifts in time allocation among household members. For example, if women are devoting more time to breastfeeding or food preparation, other household members may have to take on additional responsibilities such as carrying water or fuelwood. Therefore, it is important to direct some messages to them and to involve them in efforts to improve family diets. Source: Adapted from FAO/WHO, 1992f. For the prevention of protein-energy malnutrition, the beneficiary groups may be defined as follows. Source: Adapted from FAO, 1994a. In challenging established traditions, care must be taken to avoid the implication that others have been providing "wrong" information and to avoid blaming mothers and care-givers for believing "old-fashioned" ideas. It will be profitable first of all to convince the local people so that they are able to identify the need for change; the community will then be likely to support the proposal for change when it comes. However, it is often possible to adapt existing traditions, habits and customs without drastic change, if the nutrition worker understands not only the pattern of action to be adopted, but also the reasons behind it. All communities have evolved methods of dealing with health and nutrition problems and with seasonal food insecurities, and some of these are both relevant and effective. For example, in many societies special nutrient-rich foods are reserved for newly delivered and nursing mothers. Finger millet, Eleusine coracana, is the preferred cereal for lactating women in the Kikuyu culture in Kenya. Sorghum is relatively high in protein and also contains large amounts of calcium. In many African countries germination and fermentation are traditional practices in the preparation of cereal porridges. The use of these "culture-friendly" preparations as weaning foods and the improvement in nutritional quality of germinated and fermented grains were discussed in Chapter 6. Encouragement of these culturally established practices will form an acceptable message for nutrition communication. Local farming systems provide other culture-based practices that are nutritionally sound and ecologically sustainable, such as the intercropping of cereals, beans and pumpkins. Social support systems of food sharing, hospitality and strong extended family obligations can all be enlisted in ensuring the cultural acceptability of nutrition messages. Some further aspects of the effects of local customs and practices on food supplies and consumption patterns are included in Box 76. To avoid confusion, a clear distinction should be made between the concepts of message, media and supports. The media are the channels of communication through which messages are transmitted (e.g. talks at a health centre or school lessons by radio). The message is the formulation of an idea or concept to be transmitted to a specific population (e.g. "Fish is a healthy food for children"). Supports are the materials on which the message is transmitted (e.g. posters, radio programmes or flip charts). In designing nutrition education materials, the first consideration is to catch the attention of the audience; people must want to listen to or look at the message if it is to affect them. This aspect is of particular importance in designing materials that are to convey messages through visual means. Posters, for example, rely on their "stopping power" to attract attention, especially if they are displayed without presentation through face-to-face communication. · Traditional methods of agriculture and fishing which preserve the soil, fish stocks, etc. · acceptability (is the message free from offensive references?). Family trials are useful for pre-testing messages concerned with practical activities, such as the best way to prepare a boiled cereal food for weaning. Such trials will help to determine the best ingredients and methods in terms of family income, the mother's work pattern, family eating habits, the type of utensils and cooking facilities available and the infant's taste preferences. Development of a product that can be marketed in the community may follow. In the Niger, the Birni N'Konni Vitamin-A Mini-Project, which promoted specific seasonal foods rich in vitamin A, used role play and traditional theatre to draw out the community's responses regarding the feasibility of various options for behaviour change (Academy for Educational Development, 1995). The use of drama is also particularly suitable for nutrition communication through radio messages. In a second-phase project, village dramas from 42 communities were broadcast by a regional station over a ten-month period. Messages for radio should be short and specific so that they are easily recalled by the casual listener. The use of popular, catchy tunes to accompany the words of the message make it more attractive, and the use of two or more distinctive voices adds variety and interest. The message can be woven into a dramatic dialogue between a credible authority, such as a teacher or doctor, and a "learner" with whom the audience can identify. The message should emphasize one or two simple phrases, such as "Green leaves for bright eyes" or "Palm oil prevents blindness". These messages should be repeated frequently, with slight variations in the dialogue and speakers to reduce listener fatigue. Box 77 presents an example of a radio spot on the prevention of night blindness. The ways of presenting ideas for change will vary with the preconceptions of the target communities. The message must offer a benefit that is visible and valued. Box 78 describes the process of developing a message from a fact and modifying it based on the results of pre-testing. Some guidelines for designing messages well are given in Box 79. An effective communication strategy will often utilize a variety of messages at different stages in the nutrition education programme. In the initial stages, messages will serve to arouse attention and interest; later, as the changed behaviour is adopted, more supportive and encouraging messages will be appropriate. Box 77 - Radio spot on vitamin A: "Yellow fruit and green vegetables - the light of the eyes"
Teacher: This is correct, Jyoti. We should try to eat carrots, papaya, saag and pumpkin. A nutrition factor called vitamin A is found in great amounts in these fruits and vegetables. What should we do to prevent night blindness, a disease when a person cannot see in dim light? Boy: We should eat carrots, papayas, mangoes and green vegetables every day. Teacher: Yes. Do you all eat these things every day? Students: Yes, we do, Miss, every day. Teacher: When you cannot get yellow fruits such as these, you should eat green leafy vegetables instead. Yellow fruits and green leafy vegetables make your eyes healthy and your body strong. You have all understood this, haven't you? Students: Yes, we have all understood, Miss. Teacher: From now on, you will eat these things every day, won't you? Students: Yes, we will eat them, Miss, every day. Voice: To prevent night blindness, every child should eat dark-green leafy vegetables and yellow fruits every day. Slogan: For the light of the eyes - green leafy vegetables. In communication programmes, a distinction is made between two channels of communication: face-to-face and mass media. Face-to-face oral communication may involve, for example, an agricultural extension worker and a farmer, or a health worker facilitating a group discussion on infant feeding. Most development programme personnel are involved in interpersonal communication. They can reinforce the messages broadcast or disseminated through radio or other mass media. A selection of appropriate themes for face-to-face communication in agricultural and rural development is presented in Box 80. A problem in the area is that many young children do not grow well. One reason is that weaning foods are too bulky; they are not energy-rich, so children lack calories for growth. The nutrition fact that families need to know is: "Adding fat or oil to porridge gives children more energy and helps them to grow well." Together with other nutrition workers and local women, develop a message from the fact. Make the message simple, e.g. : "Add oil or fat to your child's porridge. Oil is full of energy and helps to make children grow well." · they want to know how much oil to add. Write and pre-test the message again until it is right. An example of the new message could be: "Mother - you want your baby to be strong and active? Add a spoonful of pounded groundnuts to each cup of his or her porridge. Groundnuts are easy to digest and do not upset a child's stomach." Communication in a group situation has been the principal means of nutrition education for a long time. In the past, such encounters were referred to as "discussions" but often turned out to be monologues. However, communication in a group situation has improved. A significant amount of material has been developed for training leaders of group discussions, including methods for group participation and visual and audiovisual supports. Forms of interpersonal and group communication include demonstrations, training sessions, exhibits, dramas and outdoor shows. Dull traditional talks are replaced by lively and entertaining audience participation (see Box 81). This approach is more likely to result in positive action for solving community problems. · Keep them short and simple; include only a few key ideas. · Give reliable, complete information. · Repeat the idea many times. · Recommend precise behaviour change. · Show the relation between the nutritional problem and the recommended behaviour. · Make use of a slogan or theme. · Ensure that the message is presented by a credible source (as perceived by the target group). · Present the facts in a direct manner. · Make use of positive expressions, not negative ones. · Use humour without being offensive to anyone. The mass media include radio, television and video, the printed press and posters. Radio and television programmes can have many formats, such as talks, debates, soap operas and advertisements. Radio is a very popular medium throughout the world and can be a powerful tool for disseminating messages and information. In some of the poorest countries an estimated 2 to 4 percent of the population has access to radio. In most developing countries in Africa, however, the proportion of the population using radios exceeds 10 percent, and in some countries, such as Kenya, it is estimated to be as high as 75 percent. The radio is primarily non-interactive; messages are generally transmitted in one direction, from the transmitter to the audience, with the transmitter having no feedback on the impact of the programme. However, recent experiences with rural radio have demonstrated its potential to stimulate lively interactions among people in the villages. Although radio is an excellent medium for motivating people and drawing attention to new ideas and techniques, it is weak for providing detailed knowledge and training. However, in some projects radio listening, if followed up by extension staff providing more in-depth information and training, can be integrated into a broader multimedia approach. Nutritional communications play a key role in development since improved nutrition is not an automatic consequence of increased food availability. Food marketers know that it is cost-effective to invest in consumer education and promotion. Without nutritional communications, development project outputs such as seeds or food supplements tend to have little or no effect on the food practices of the groups for whom they are intended. The common themes of nutritional communications can be divided into those related to agriculture and those related to health and child development. · food storage and preparation, using appropriate local construction materials, fuel, etc. · feeding during illness, especially the need to rehydrate and nourish young children who have diarrhoea. Involving all members of a community facilitates dietary change. As part of an FAO nutrition project, a village in the Niger organized a recipe competition in which traditional foods rich in micronutrients were used. Men, children, schoolteachers and community workers were invited to be the judges of the foods produced. The competition was widely promoted, and women were motivated to do their best. Many villagers were surprised to find that they actually enjoyed foods that until that time they would not have eaten. This alone made it easier for them to accept suggestions to change their eating habits. At this point, they were ready to support changes in the family diet. By involving everyone in the community, the organizers created a supportive environment in which changing behaviour became desirable. Because the activity educated various segments of the population in addition to the primary target group, its results became a stimulus for further change. Television's strength lies in its combination of moving images and sound. Although messages transmitted through television may be persuasive, this medium is not easy to use for agricultural and rural development in most developing countries because it is not accessible to most people in rural areas. However, it has begun to exert enormous influence in urban areas of most developing countries. Video has become the medium of choice in the minds of many. Indeed, it is highly effective, but it calls for a careful strategy, skilled producers and access to post-production facilities. Despite the higher costs, video has largely taken over from slide sets and filmstrips, which have proved an invaluable training aid in rural and agricultural development but which lack the appeal of video. Video is similar to television, but its electronic recording of images and sound enables immediate playback and production flexibility. The printed press also has its shortcomings, which are linked to problems of limited literacy and circulation. Newspapers can be used in communication projects if the aim is to mobilize a literate population in towns. Newsletters, brochures and leaflets and T-shirts may be appropriately used for the sensitization of professionals in agriculture, education and health. However, posters using images without text, in conjunction with other media, can serve as an effective means of communication also for non-literate persons. The choice of media for a nutrition communication programme will ultimately depend on many factors, including the amount of funding available, the literacy level of the target audience, the availability and level of training of extension personnel and the geographic coverage of the programme. An important consideration which is sometimes overlooked is that even in households with access to certain media, such as radio, women may not have access to the media when needed. Although a radio set may be considered household property, it is often the head of the household who determines the listening time and chooses the programmes. A multimedia approach, such as a radio campaign combined with face-to-face communication by an outreach group of well-trained extension workers to support the campaign at community level, is the most effective way of conveying nutrition messages. The different media reinforce each other in terms of the number of people reached, the frequency with which an individual hears or sees a specific message and the content of the messages received within a given period. Timing is vital, especially for mass media messages, which are usually expensive and often of short duration. Broadcasting a message to an agricultural community at a time when the people are all working on their farms would be a waste of resources. Similarly, open-air film or slide shows and dramatized theatre performances will be better attended in dry weather, after the main harvest period, than during the early rains. A talk to women on the best foods to buy for family meals would probably be more effective if presented at the village market when the women were making their purchases, rather than at a health centre during a baby-weighing session. Nutrition messages for urban communities will be based on the recognized problems encountered by many families and individuals in making the transition from a largely self-sufficient food supply system, based on home production, to an urban cash-oriented food system. The gap between the rate of urban migration and the creation of urban employment opportunities is widening, and as a result urban poverty is increasing in many countries. Food purchases, consumption of processed and canned food and dining outside the home are more frequent in urban than in rural areas. Nutrition messages may address problems of hygiene, food safety, food labelling, economic marketing, snack foods, soft drinks and alcohol and drug abuse, as well as directing attention to benefits available through targeted food subsidies and direct food distribution programmes. Governments will need to address seriously the issues and problems in the urban setting in order to enable consumers to make nutritionally sound and affordable food choices. Radio can provide a cost-effective medium for nutrition messages targeted to urban consumers. In the major towns and cities, use of television can also be considered, perhaps employing live appearances of well-known public figures and entertainment personalities or soap opera-type series for video transmission of relevant messages. Some guidelines for effective nutrition communication programmes drawn from an analysis of some successful programmes are provided in Box 82. · In-depth research is needed to develop an effective communication strategy. · The most effective nutrition communication campaigns and products are based on consumer preferences. · Specific, action-based behaviours have the best chance of being adopted. · Identifying and reaching other influential target audiences may be critical to influencing the primary target audience. · Community leaders and networks are often an effective channel to promote solutions to nutrition problems. · Frequent exposure to messages is essential. · Interpersonal and mass media channels must be evaluated for their potential to reach sufficient numbers of the target audiences with sufficient frequency to cause impact. Most programmes need a combination of interpersonal and mass media to be effective. · Outreach workers must be trained in counselling and communication skills and supervised regularly. · Long-term effort is required to sustain behaviour change. Schools provide a special medium for nutrition education and for intervention to improve children's health and nutritional status. The basic aim is to help children acquire nutrition knowledge and to develop and encourage desirable eating habits and food choices. Children can also help change the eating habits of their families by demanding desirable food, and when they themselves become parents in the future, they can impart good dietary habits to their children. Therefore, a common maxim about how to bring about a real change in dietary habits is "Go to school". Available evidence on the effectiveness of nutrition education programmes in schools shows that nutrition knowledge is most effective if there is a supportive environment and if nutrition education is linked with practical food- and nutrition-related activities (Lytle and Achterberg, 1995). Lunch, feeding, gardening and health programmes in schools offer special opportunities for practical teaching in nutrition. Student participation in school gardening, menu planning, food selection (ideally from locally grown and processed foods) and food preparation offers pupils first-hand experience in learning nourishing and hygienic dietary practices. The classroom can thus serve as a "laboratory" where proper eating habits can be demonstrated and reinforced in practice. Another important way to build a supportive environment for nutrition education in schools is to involve the parents. The Child to Child Programme, for example, is based on the concept of children as social educators and as effective intermediaries for messages directed at their parents. However, in this programme it is important to engage the parents and other family members in the activities and the learning experience as much as possible. For example, parents can become involved in food production, especially in school gardening. In the Eastern Province of Sierra Leone, an innovative approach to nutrition education was adopted through restructuring of the teacher training programme of the Bunumbu Teachers' Training College, with the cooperation of the Ministry of Education and the assistance of the United Nations Educational, Scientific and Cultural Organization (UNESCO). The objective was to train a new type of primary schoolteacher, who would be able to assist the local communities in identification, analysis and improvement of their own nutritional situation, in addition to providing a more relevant and appropriate curriculum for home economics teaching at the primary school level. Examples of the instructional materials prepared for this course are given in Box 83. School programmes have greater impact and can be sustained longer if they are tied to community activities. A school gardening programme provides an excellent opportunity for community involvement where water availability does not pose a constraint, and agricultural extension can support the programme by providing the necessary inputs and advice. This type of programme helps gradually to replace "nutrition education" by the promotion of a "nutritional environment", which involves everyone from the educational authorities to the village community. The aims of such programmes are therefore not only to transmit knowledge to children, but also to improve the quality of school and village life. The following instructional materials on nutrition education were prepared for college students in order to facilitate the respective teaching-learning situations in which the students found themselves. · Chart on baby food, "Make your benniseed mix"
· Poster, "Mother's milk is the best for your baby"
· Chart, "Preparation of diarrhoea medicine at home"
Schools provide a long-term perspective for change in social communication in nutrition. The messages disseminated at social centres, dispensaries and elsewhere will find a fertile ground with the future adults of the society if the schools undertake their training in nutrition now when they are young. Attention has been drawn to the interdisciplinary nature of nutritional problems and also to the advantages in looking at the entire food chain from producer to consumer in planning interventions. Accordingly, the implementation of a social communication programme in nutrition requires the collaboration of specialists in different sectors, including agriculture, education, communication, nutrition and health, and each must have a clear understanding of his or her role as a team member. Most professionals, apart from health personnel and nutritionists, lack even basic knowledge about human nutrition. To participate effectively in nutrition education activities, such professionals require some basic training in nutrition. It is important that the training also incorporate training in participatory problem assessment as well as participation in multidisciplinary activities. Enabling project staff to involve community members in a genuine dialogue about their food and nutrition concerns and to coordinate nutrition programme activities among different sectors and levels is crucial for programme success. Most agricultural extension workers have close and regular contact with farmers, including women farmers, in the community. Therefore, personnel in agricultural extension, including home economics extension, have a vital role in the dissemination of nutrition information and the content and messages of programmes in nutrition education and communication. Agricultural extension agents are well placed to promote the production and consumption of a varied diet to improve the nutritional security of farm households. Similarly, the complementary improvement of agricultural productivity, leading to improved incomes, and the creation of more employment opportunities, especially in the post-harvest preservation and processing of farm products, will provide overall benefits to agricultural communities. The role of the agricultural extension officer is to work in partnership with community health and nutrition officers and encourage the farming community to make the best use of its agricultural assets and opportunities. Agricultural extension officers can provide guidance on message development regarding what crops can be grown in the area and which are the most preferred and profitable. They can also help local farmers select the varieties and landraces of local seeds best suited to the environmental constraints of the area, and they can advise the community on seed propagation and distribution through the nutrition education communication network Through attendance at farmers' clubs and credit organizations, they can advise and assist farmers on the best procedures for securing loans and increasing productivity, and they can develop messages to communicate this advice and information to a wide audience. Agricultural extension officers can also devise technical messages to encourage farmers to produce and to market a wider variety of crops to extend the cropping period, and they can develop and promote, in collaboration with local farmers, more extensive mixed cropping systems to maximize use of the available land. By listening to the farmers, agricultural extension officers can identify farmers' constraints and problems and can ensure that nutritional messages are relevant, realistic and feasible. These workers are thus in a very good position to guide the nutrition sector to address the priority food problems, as judged by the communities themselves. In Africa, home economists, often also working in the ministry of agriculture, are an important group dealing with the improvement of household food security and nutrition, particularly in rural areas. They advise households on how to improve family resources and how to make efficient use of what is available to them. They educate families on improving methods of cooking to preserve the nutritional value of food and to save fuel, on improving traditional methods of food preservation and storage, on feeding different members of the family according to their nutritional needs and on other aspects of family life. Nutrition is usually taught as a subject in home economics training. It is important that such training include field experience and be practically oriented, so as to make trainees more competent to deal with the situations prevailing in the rural areas of Africa. Having acquired broader understanding of food and nutrition security, agricultural and home economics extension officers will appreciate the need for messages to promote nutrition-oriented home gardens to prevent micronutrient deficiencies. They will encourage the community to adopt a more production-oriented approach to the raising of small animals and the establishment of fish ponds, not only for commercial purposes, but also for home consumption. In all of these activities, agricultural extension officers will help to secure a regular and sufficient supply of a wider variety of foods for household use. It is often only an ideal to envisage a village community well served at regular intervals by a whole team of extension officers in community health, nutrition, fisheries, agriculture, education and family planning. In reality, the "man on the spot" (or sometimes "the woman on the spot"), often an agriculturist, is frequently called upon to give advice on a wide range of problems. Thus, providing agricultural field staff with background and training that include experience and exposure to human problems including malnutrition, as well as to crop and animal production, will be a valuable investment in human resources for the benefit of the public. The converse is also true: nutritionists also need to learn about aspects of agriculture and to experience at first hand some of the problems involved in feeding a family with food produced on family land. Thus it may be desirable not only to introduce nutrition into agricultural training, but also to train rural development officers in different technical subjects, including nutrition, community development and agriculture, through a people-centred approach to rural life. In some African countries, ministries of agriculture and ministries of education are already well aware of the need for closer integration of the production and consumption aspects of food and nutrition and are running educational programmes to promote this integration in both extension and training. In several Sahelian countries, the agricultural information department of the ministry of agriculture runs special programmes intended to ensure the population's satisfactory nutritional status by increasing and diversifying food production and by promoting the improved utilization of foods. National teams of nutritionists and communicators are trained to use rural radio programmes and films of village life to convey nutritional messages to farming communities (see Box 84). Health workers are the key group attending to mothers and children who are most vulnerable to malnutrition. They have for a long time had a special role in imparting nutrition education. Only recently has their training been modified to go beyond the simple treatment of disease towards promotion of better nutrition and public health and hygiene. In Africa, as elsewhere, the prevention of malnutrition and the promotion of good dietary habits should take precedence over treatment. Thus more emphasis on food is called for during training, so that the health worker can recommend locally available nutritious foods and explain how to introduce them and how to prepare diverse mixtures using them. Collaboration with agricultural extension workers will help in the development of realistic messages and skills. Communication specialists are important in the modern world with its complex communication systems. They have a special role in designing and formulating nutrition messages and translating them into appropriate materials. Communication technicians are responsible for audiovisual materials and aspects of sound and editing. Media journalists are also needed. However, there is a shortage of media specialists in developing countries, especially working in association with ministries of health, agriculture and education. Media journalists tend to be trained as generalists; few have the expertise to communicate health and nutrition information to the public correctly. Therefore, more training programmes such as the one presented in Box 84 are necessary to promote effective and successful nutrition education programmes. Nutrition-related action is a delicate undertaking that requires an integrated approach involving the health, agricultural, educational and social sectors at all levels. Nutritional communication has an essential role in social mobilization and encourages the behavioural changes needed to improve nutritional status. Communication is an important feature of daily life involving the sharing of knowledge, ideas and techniques. With this in mind, FAO implemented a regional communication support programme entitled "Communication Support for Sahelian Programmes against Malnutrition and Vitamin A Deficiency". Multisectoral teams were formed in Burkina Faso, Chad, Mali, Mauritania and the Niger to support the implementation of social, educational and institutional communication campaigns. The emphasis was on radio programmes, audiovisual aids and video, the final objective being to involve the village communities as the leading players in the process of enhancing household nutritional status. The project's main activity is the training of multisectoral communication teams. The training comprises three participatory workshops: the first on rural radio, the second on audiovisual aids and the third on video. The project brings together the national contact points and the representatives of the other partners. One important project output has been the listing of ten priority areas for a multimedia campaign against vitamin A deficiency and malnutrition in the Sahel, including: pointing out the link between diet and disease; encouraging production of locally appropriate foods; diversification; conservation and processing throughout the year to ensure household food security; increasing consumption of foods rich in vitamin A and iron among vulnerable population groups; and involving the village community in the identification and management of nutrition problems. Source: Adapted from Rokia Ba Touré, 1993 (English summary). Policy- and decision-makers are another category of personnel requiring nutrition information. Government officials responsible for development are the most powerful actors because their decisions and actions determine the welfare of their nations. It is therefore of great importance that they understand the nutritional implications of their policies and plans. Nutritional advocacy at the political level and specialized training or "awareness raising" of planning personnel should be an integral part of any national programme, including nutrition education programmes. Planners and decision-makers must understand the nutritional needs of the population as a whole, the need in poor communities for adequate, safe and appropriate diets, and the consequences of overconsumption. This understanding will enable them to take appropriate measures when planning national food production and processing and import and export marketing in order to improve access to food by the most vulnerable groups. They also have a part to play in approving appropriate nutrient levels and safety standards for manufactured foods. They must recognize the negative effects that structural adjustment policies and programmes and the removal of agricultural subsidies can have on the nutritional status of vulnerable groups. Some examples of nutrition communication programmes directed at policy-makers are described in Box 85. Advocacy at policy level should include messages regarding the magnitude and economic costs of national malnutrition problems and their consequences such as nutritional blindness, physical infirmity and mental retardation. Messages should stress the detrimental effects of nutritional deprivation on the national budget and at the same time should explain how these problems could be prevented at minimum cost, with consequent gains to national development. Policy-makers constitute a powerful audience for nutrition communication. In Brazil, the support of policy-makers was indispensable in a massive national breastfeeding campaign during 1981 and 1982. To enlist their support, breastfeeding advocates prepared a hard-hitting slide presentation which stressed not only the nutritional and health benefits of breastfeeding but also the cost and loss of hard currency associated with use of breastmilk substitutes. The slide presentation motivated cabinet ministers and other high-level officials at the national and state levels to make a major commitment to breastfeeding promotion. Not only do policy-makers set budget priorities, they also have the power to make broad legislative changes that can have a major impact on nutrition behaviour. For example, policies regarding maternity leave, provision of child care facilities and breastfeeding equipment at the workplace and work breaks for breastfeeding could help working mothers to continue breastfeeding and avoid use of breastmilk substitutes. Similarly, laws requiring fortification of specific foods (e.g. iodization of salt and vitamin A supplementation) can greatly simplify the problem of adding micronutrients to deficient diets. For example, in Guatemala, following strong lobbying efforts by nutrition specialists, a law was passed during the 1970s requiring all centrally processed sugar to be fortified with vitamin A. This greatly simplified the problem of distribution. Even after laws are passed, nutrition communication can play a role in ensuring that they are enforced. For example, in Santa Catarina State, Brazil, the proportion of industries having child care facilities increased from less than 10 percent to 85 percent within one year following a 1982 to 1983 media campaign explaining the legal requirements. Another underutilized role for nutrition communication programmes is to educate policy-makers on the nutritional impact of other development policies pertaining to agricultural production and prices, macroeconomic factors, population growth and distribution and environmental quality.